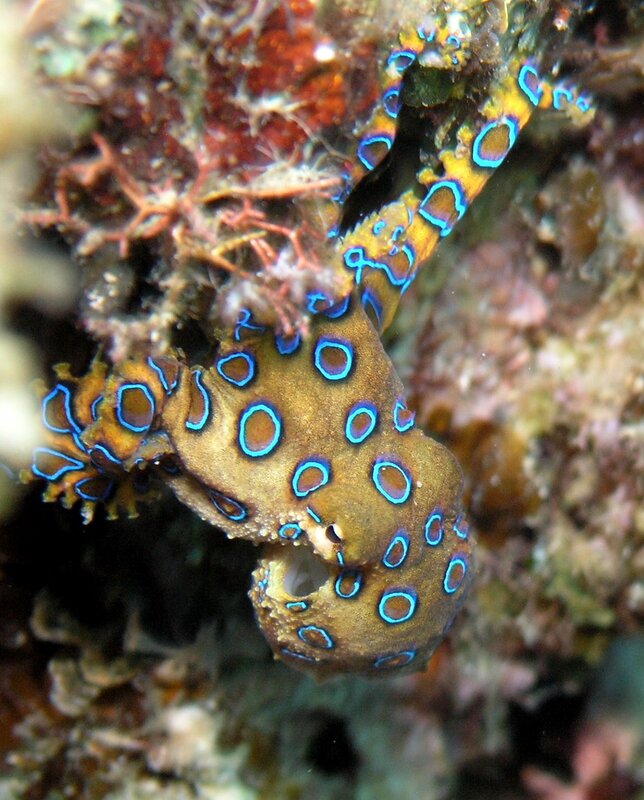 FEATURE ANIMAL: BLUE RINGED OCTOPUS! 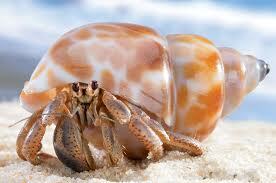 We’ve traveled to the Western Pacific Ocean, near Australia today to meet our creepy crawly Feature Animal. 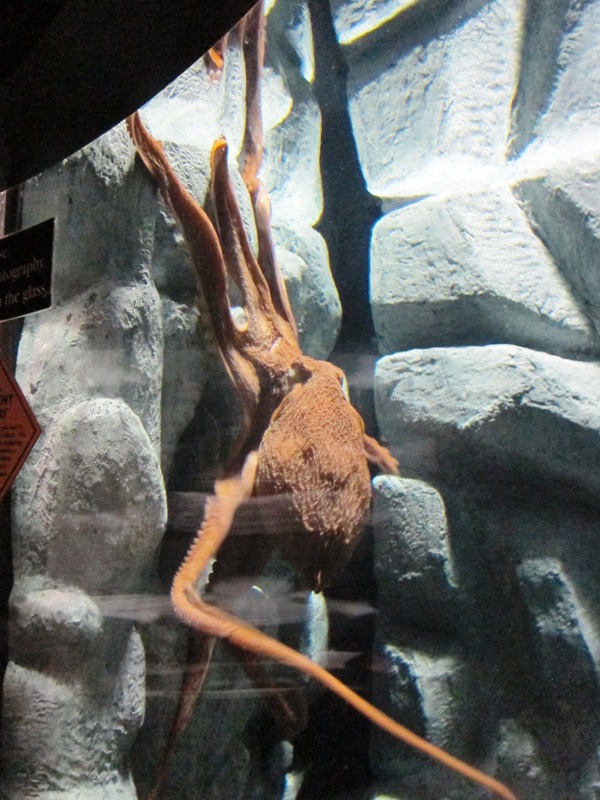 Yesterday was also World Octopus Day- so we knew we had to track down this elusive creature. 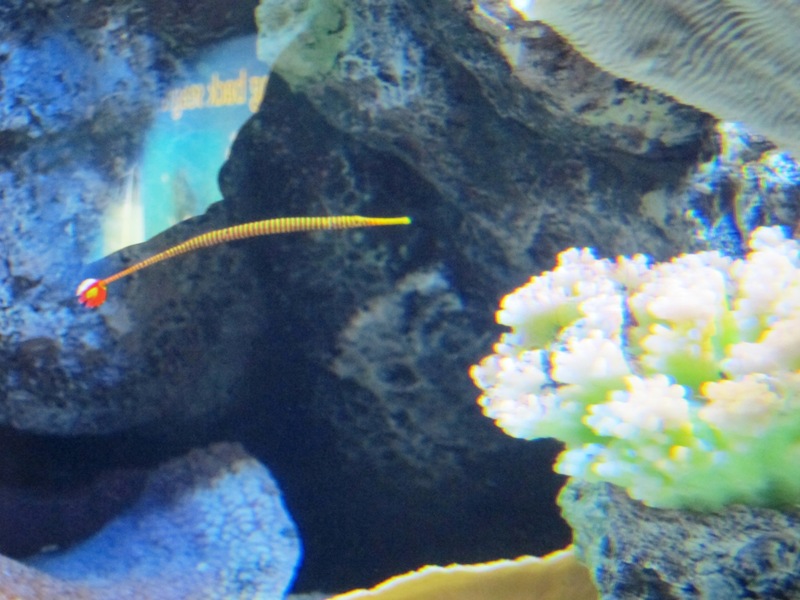 It wasn’t easy to spot this cephalopod, but we did! 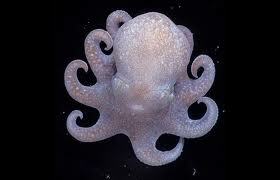 • Blue ringed octopuses are known to hide in caves, crevices and trash, such as bottles and cans. • They are diurnal (hunt during the day). 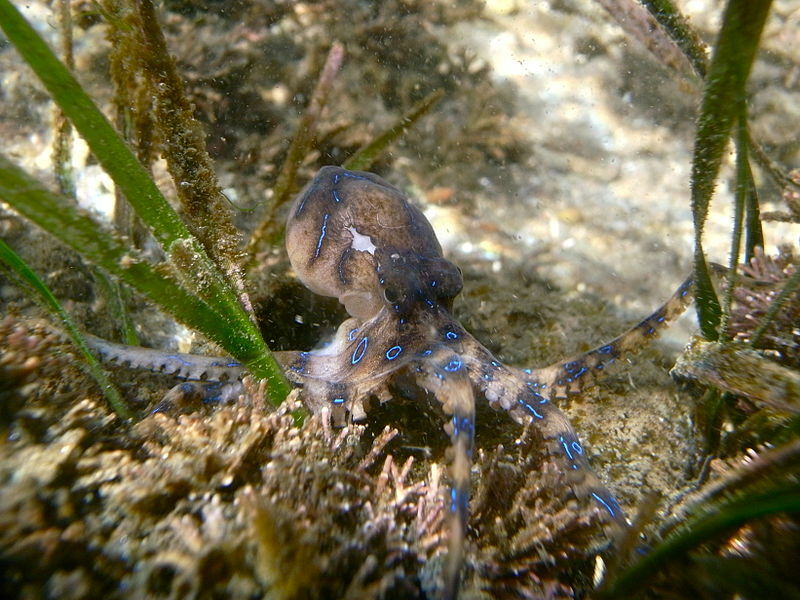 •Blue ringed octopuses are shy! 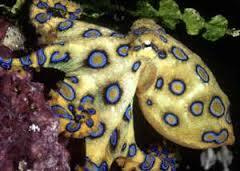 • Blue ringed octopuses are extremely toxic. Their venom is more toxic than any land animal. • They are not normally aggressive towards humans. • They have rough wrinkly skin. 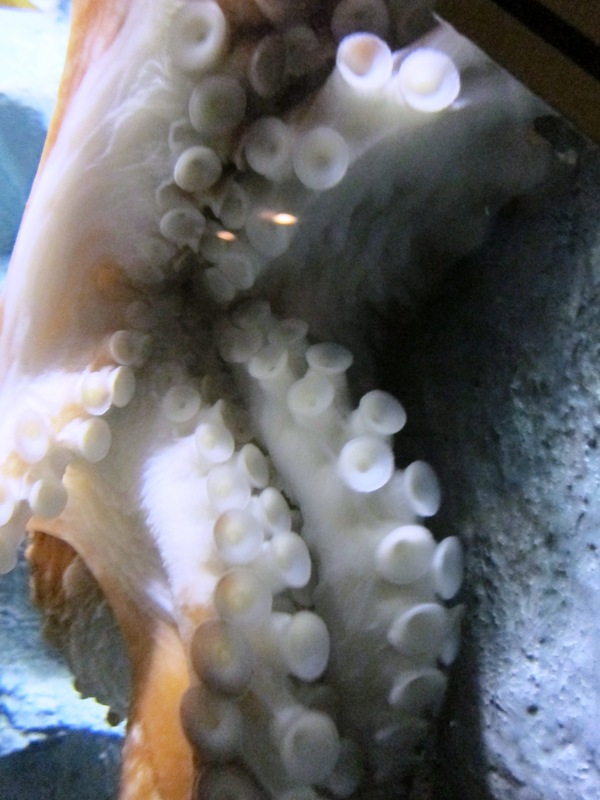 • Blue ringed octopuses display their famous blue spots when they feel threatened. 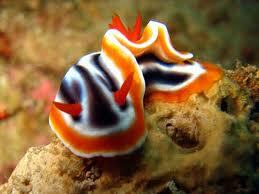 This is called warning coloration. 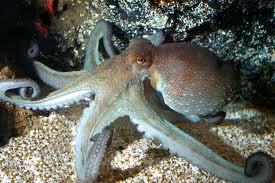 • Blue ringed octopuses are considered intelligent. 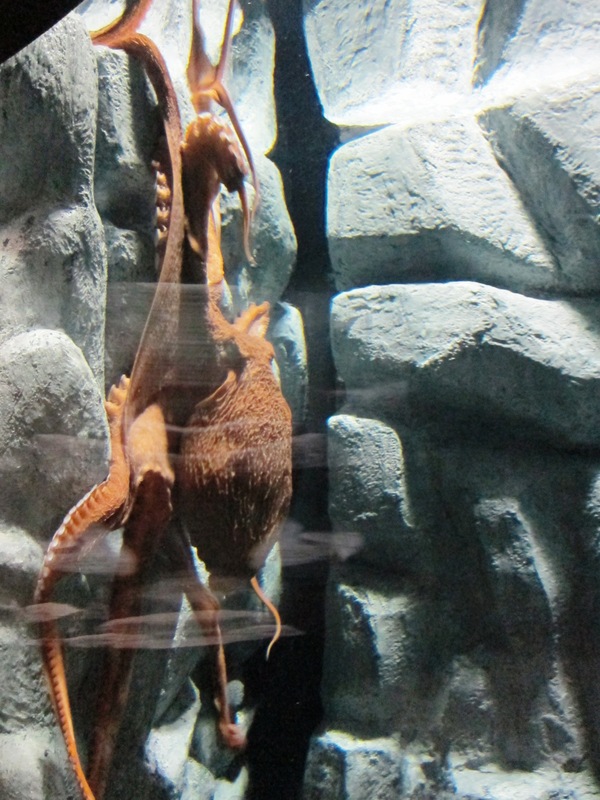 We love octopuses! They are such amazing creatures and so smart! 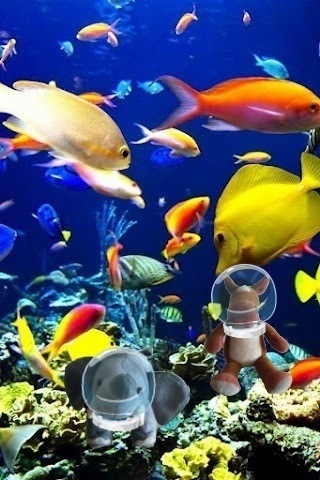 Have you ever seen one solve a puzzle in an aquarium? Here’s a video of one opening a jar to get dinner! 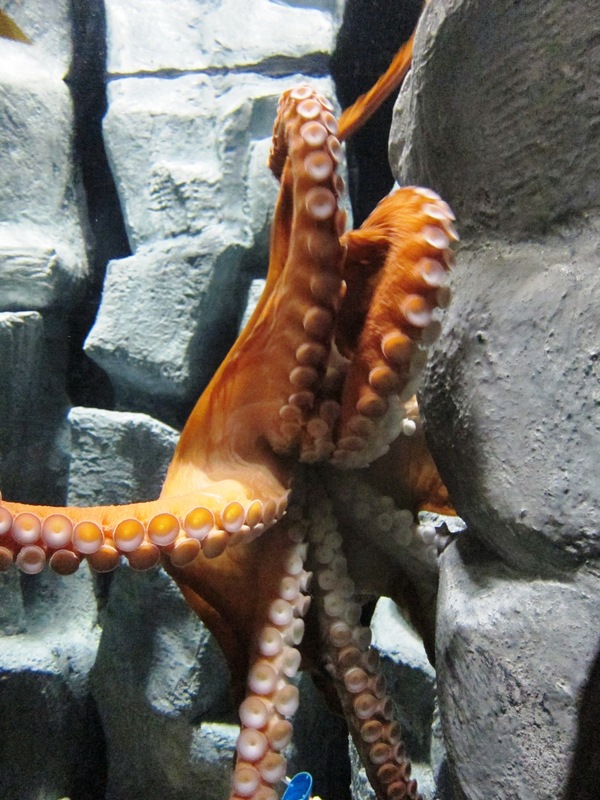 You humans are no match for our big brains- said all octopus :)! Field Trip to the Tennessee Aquarium! 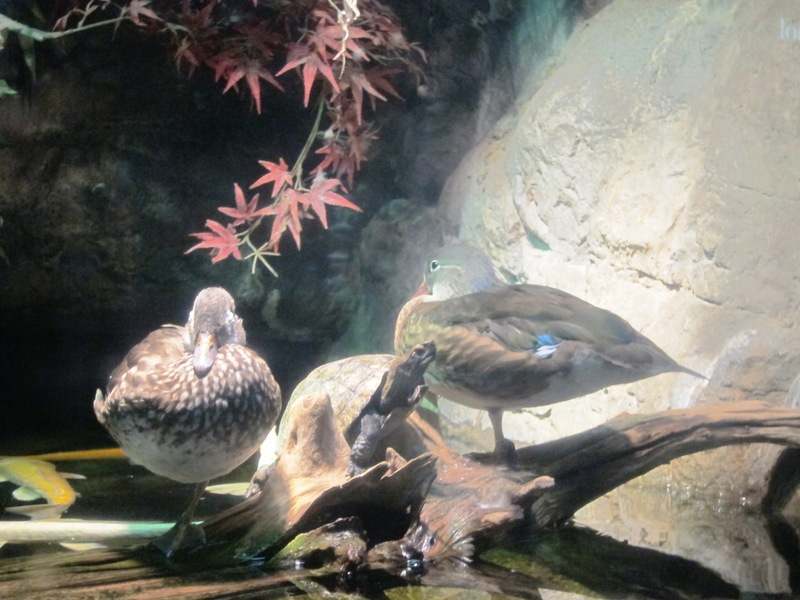 Recently we took a road trip to the Tennessee Aquarium in Chattanooga, Tennessee and man did we have a great time! 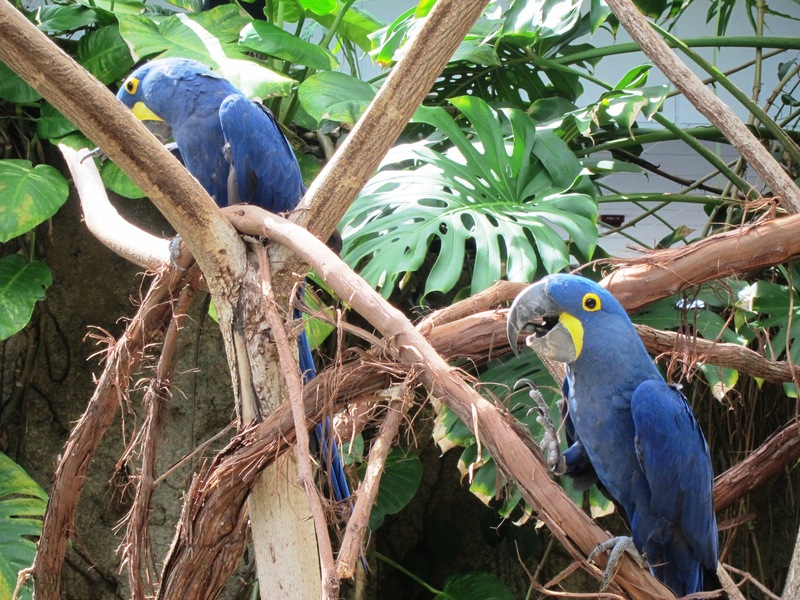 The Tennessee Aquarium has not one but TWO buildings to explore! 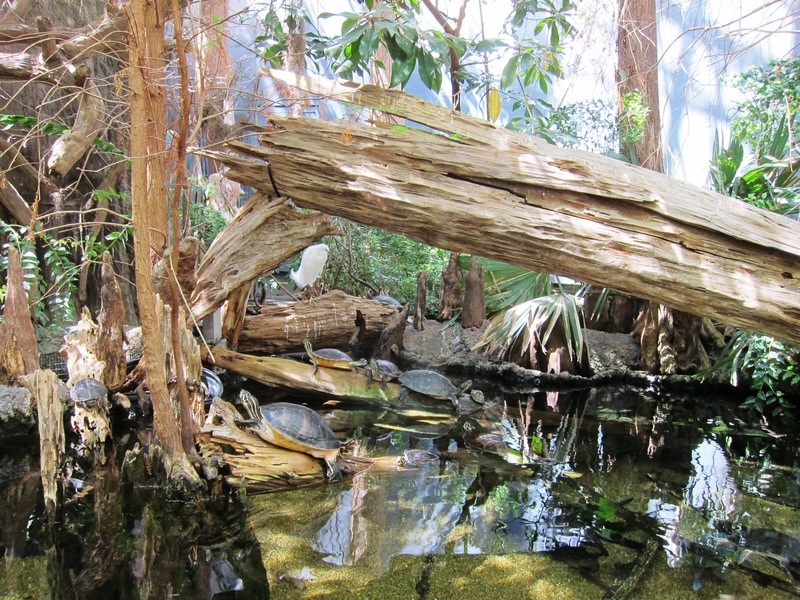 The first one is dedicated to fresh water habitats and the second building houses some of your favorite ocean dwelling animals! 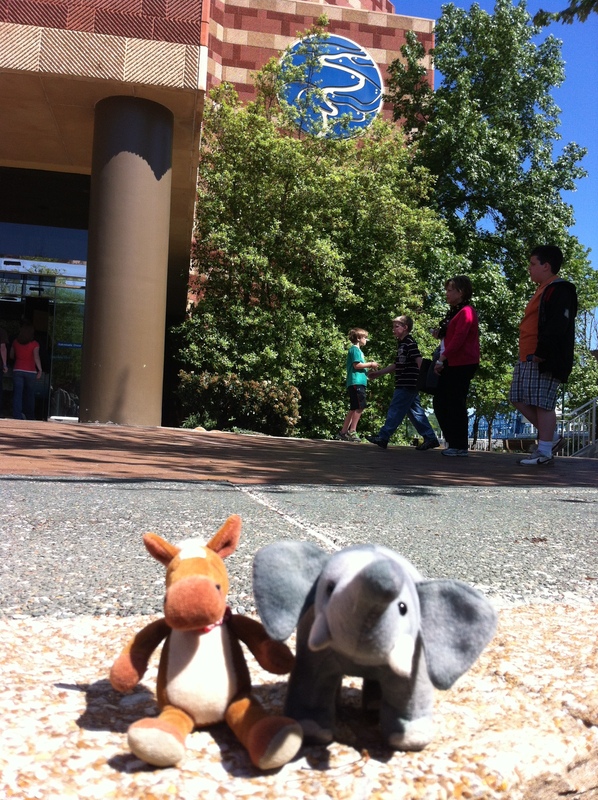 That’s right everyone, you can spend your day visiting animals from all over the world and that is exactly what we did! We started out hanging out in the plaza, getting the lay of the land and deciding on where we should start. Out front of the Aquarium! We decided to head into the Freshwater building first! 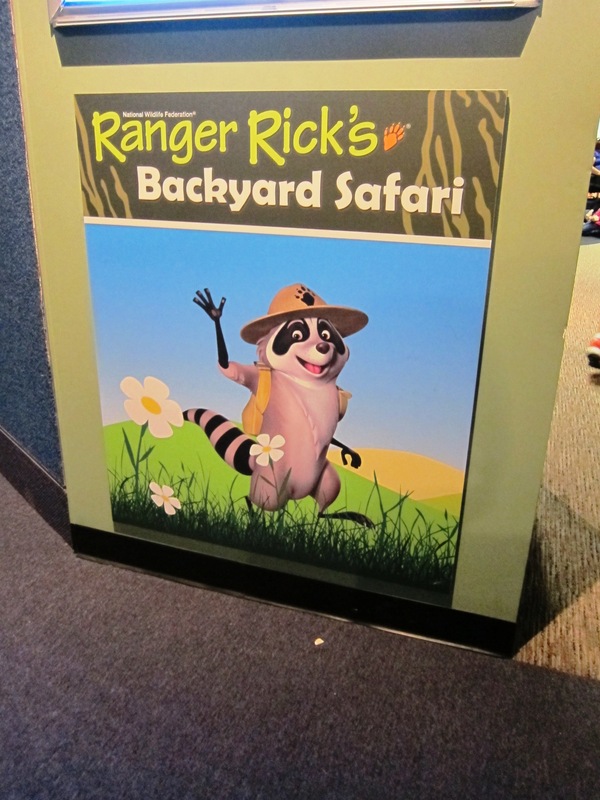 There, they not only have great animal exhibits, but they have Ranger Rick’s backyard safari! 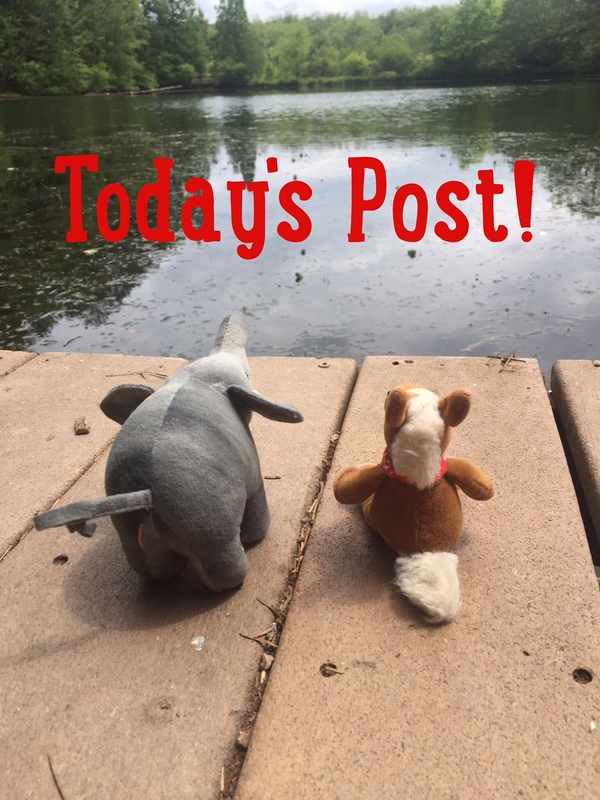 We headed down to check this area out and catch a live animal encounter! 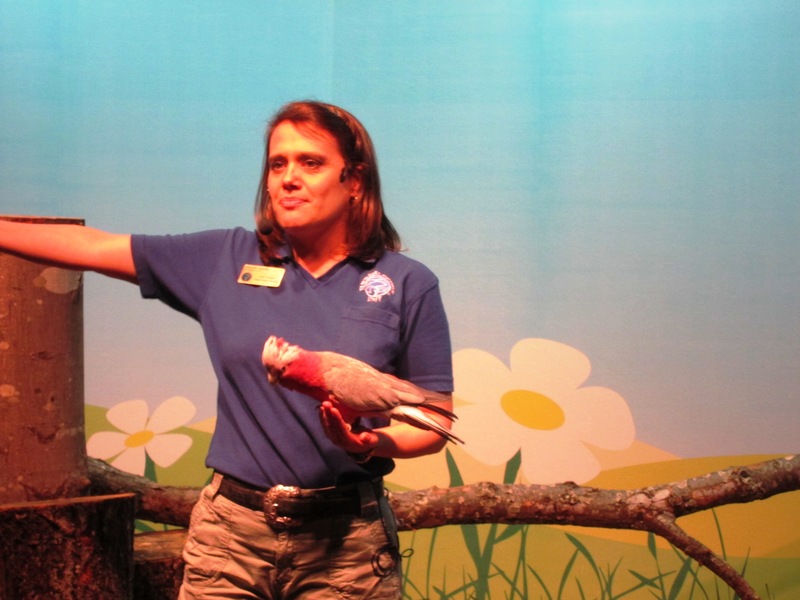 We stayed to meet some cool birds, including the Galah. 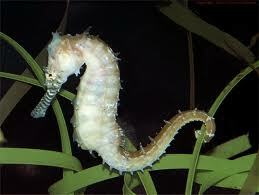 Our next stop was to check out some sea horses and their relatives! They are just so cute! We then boarded the escalator that takes you to the top of the building, where you make your journey through cool freshwater habitats! Isn’t it neat that you start from the top and make your way down to the bottom! 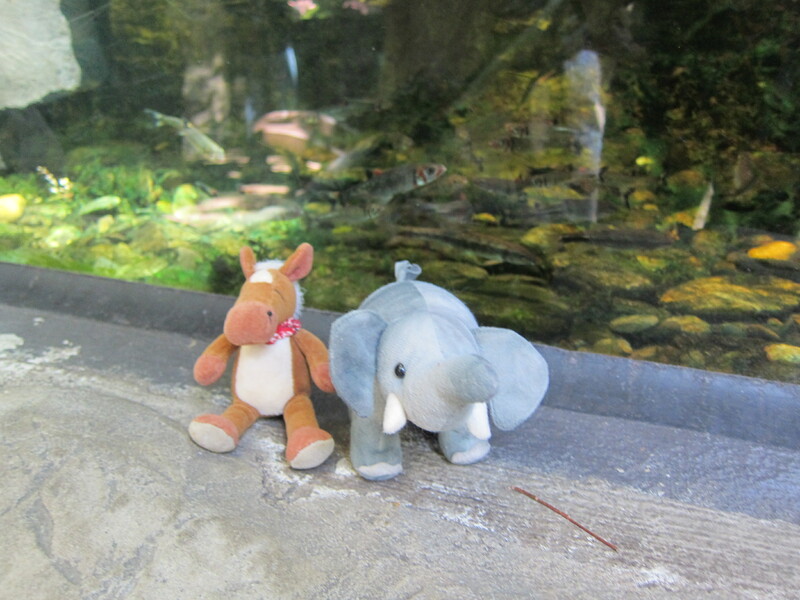 This is where we met some adorable river otters! 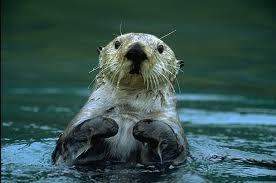 Otters have a good time! 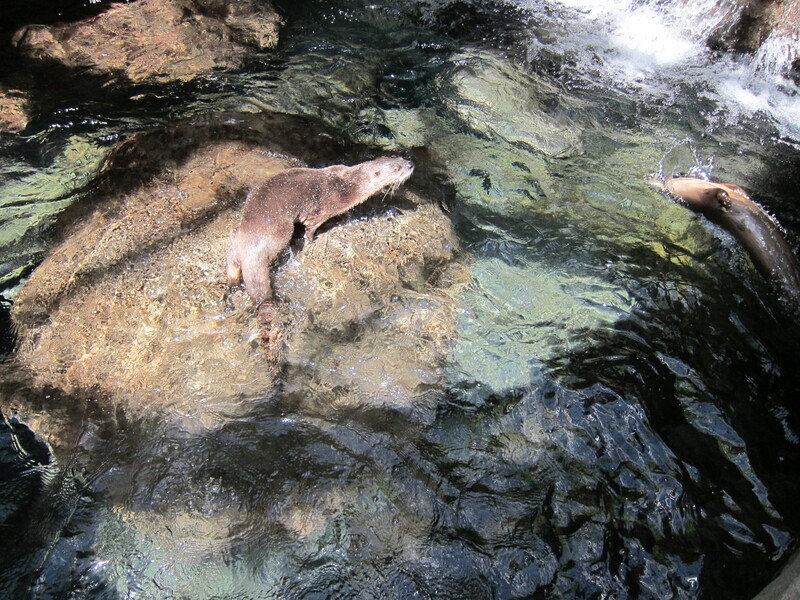 These guys are so playful and graceful; we could have stayed there for hours! But alas, we had to keep going, there was much more to see! 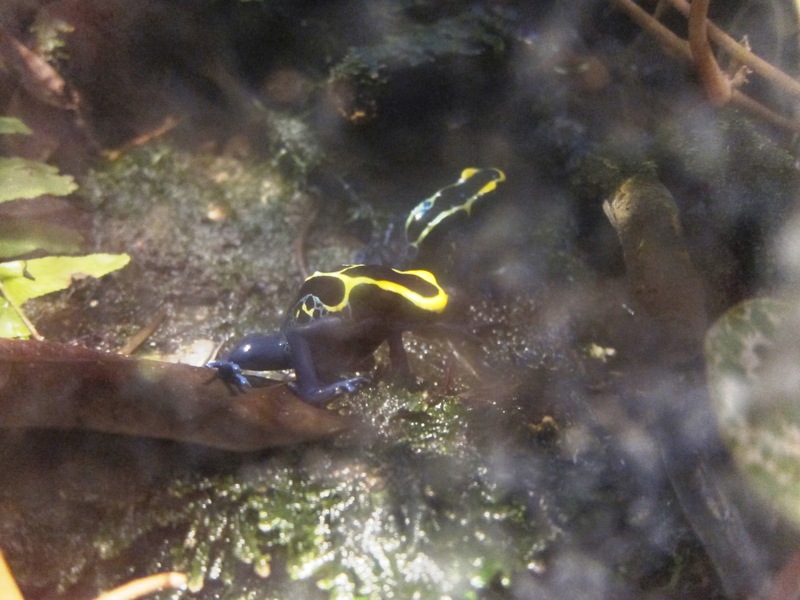 Then as we kept exploring we stumbled upon some amazing amphibians! 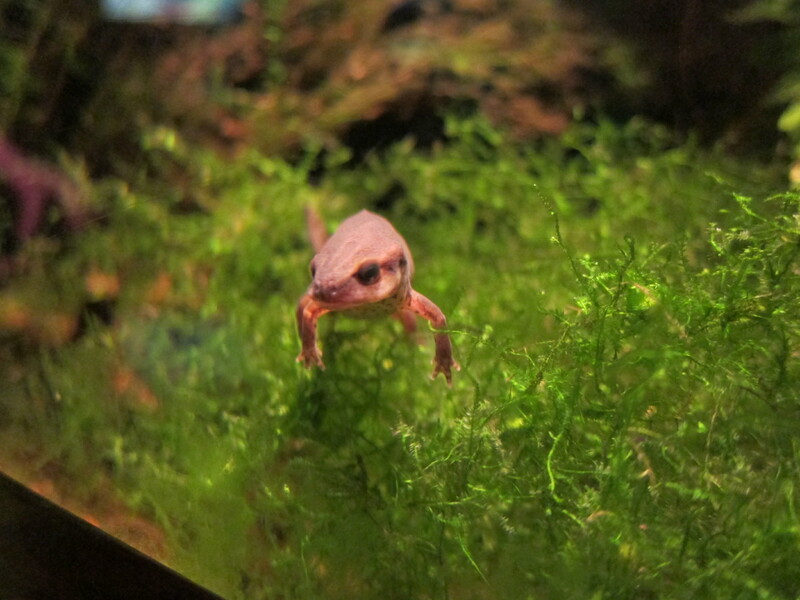 Check out these frogs and newts! We’re even bigger than this guy! Next was a big exhibit with all kinds of reptiles, fish and birds! 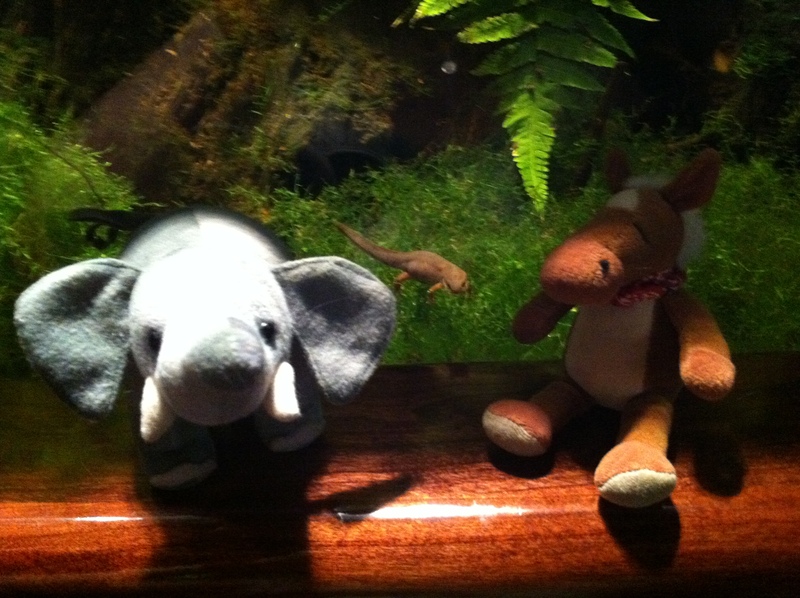 They all live in one habitat, because that’s how it would be in the wild. 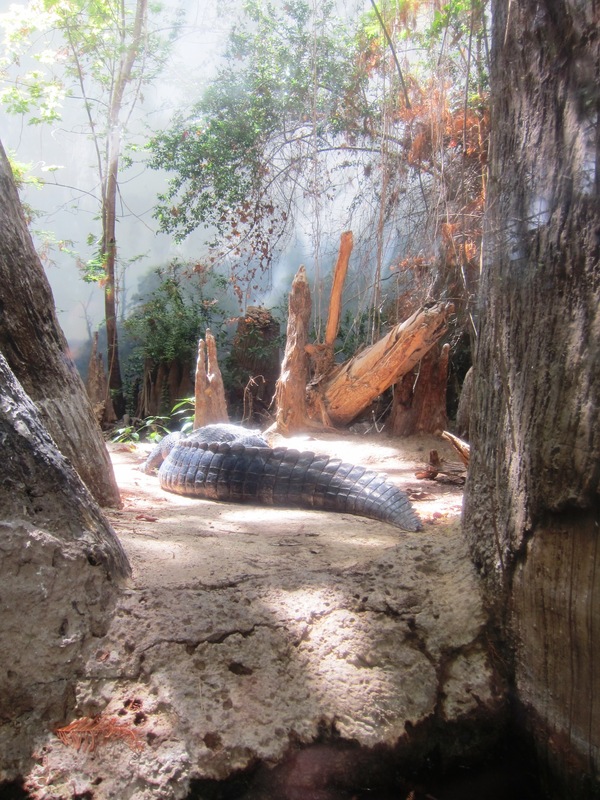 Well, the American Alligator was separated from the other animals, but that’s understandable. Turtle and ducks getting along! and the Long neck turtle. 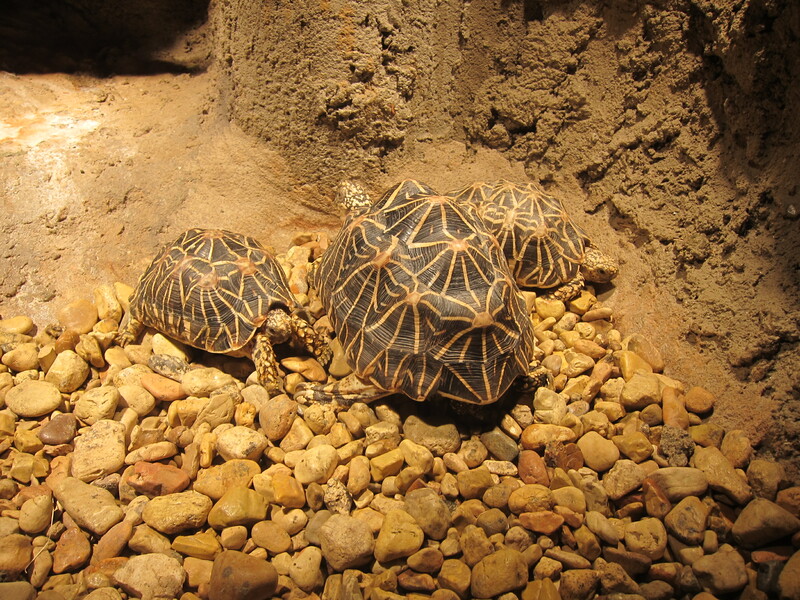 Wow, turtles and tortoises come in so many shapes and sizes! 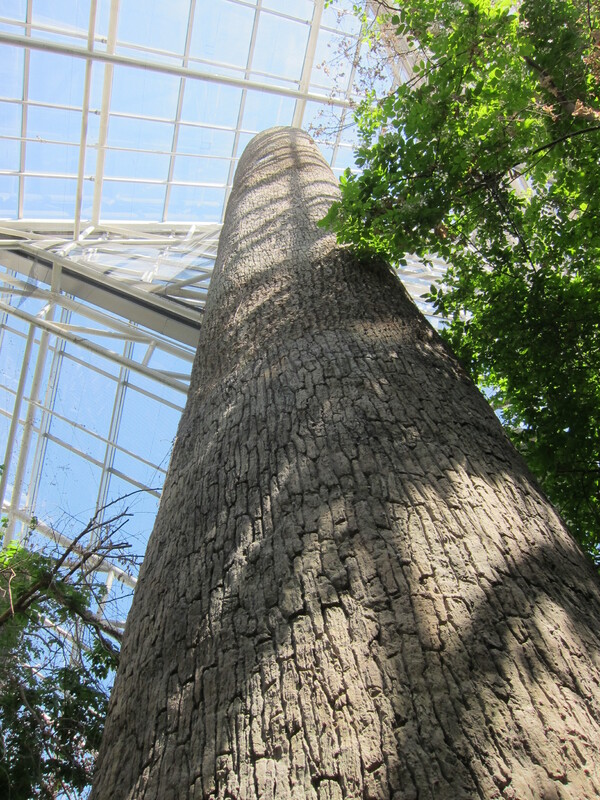 The big exhibit in this building was shut down while we there, because the aquarium was prepping for their new exhibit River Giants! That’s ok, because it just gives us a reason to go back :)! 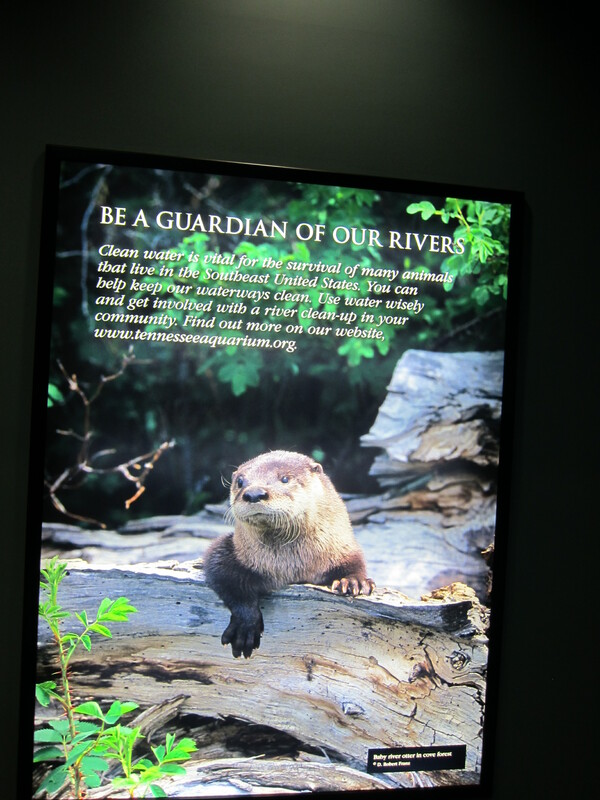 We just love all the conservation messages that the aquarium has all around too! We need to protect our rivers! We took a lunch break to refuel before heading over to the second building! 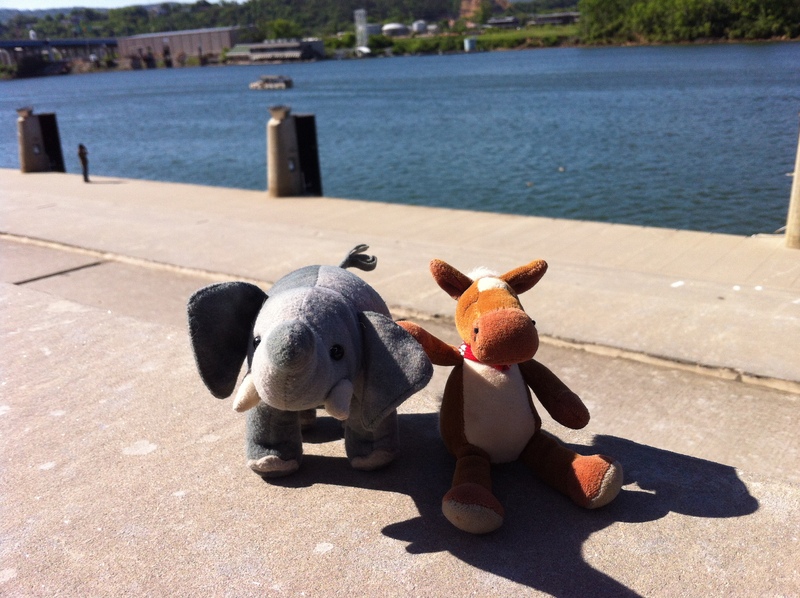 We chomped on some apples and hay by the Tennessee River. 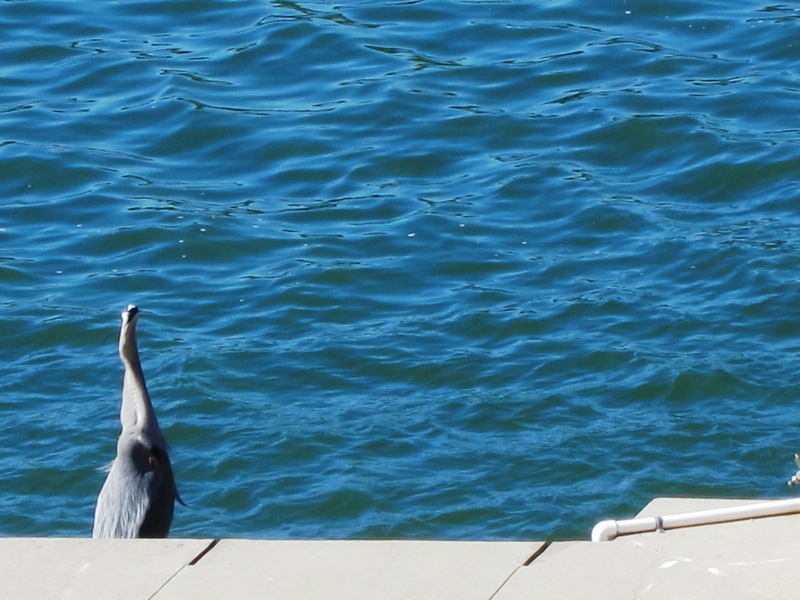 As we were sitting there we watched a wild Great Blue Heron have some lunch too! He scooped up a fish from the river and swallowed it whole! YUM! Heron! Look closely and you’ll see the fish in his throat! Having lunch by the river! After lunch, we were ready for our second adventure for the day! 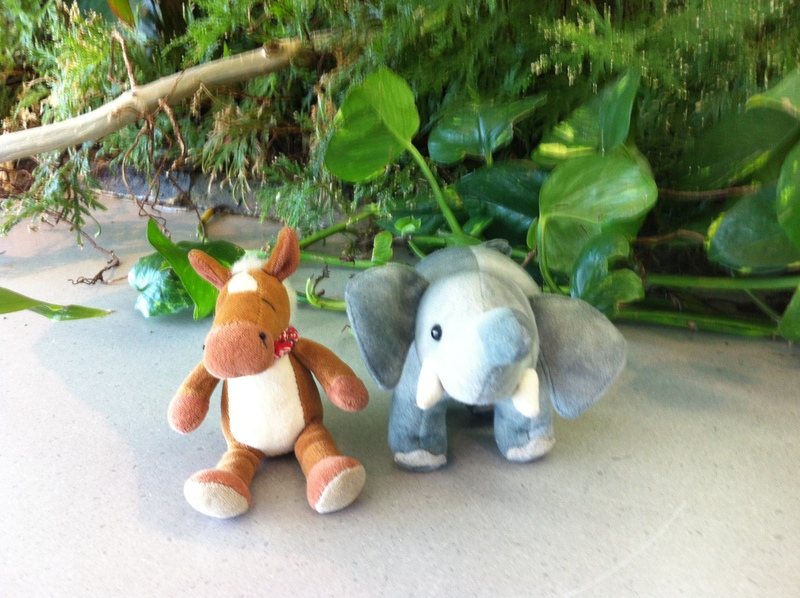 We found a lovely habitat that took us to basin of the Amazon! 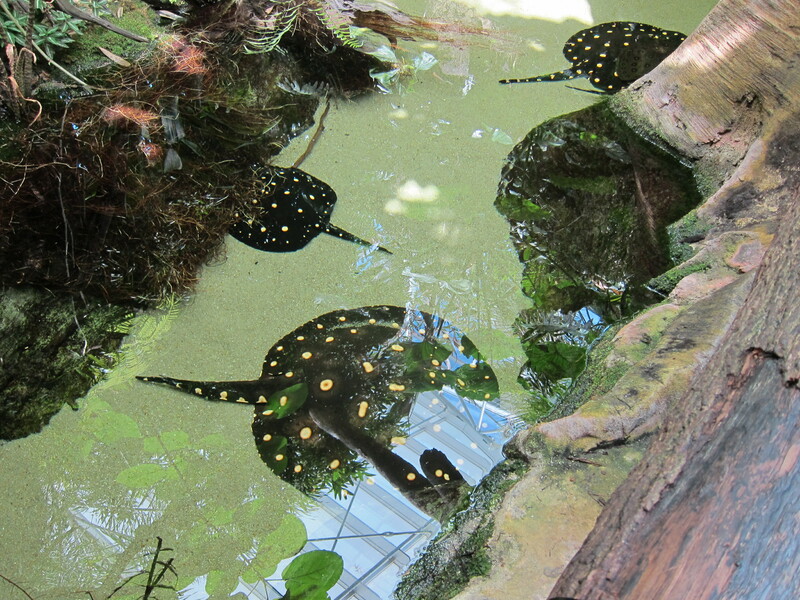 We first found some very spotty fresh water sting rays! 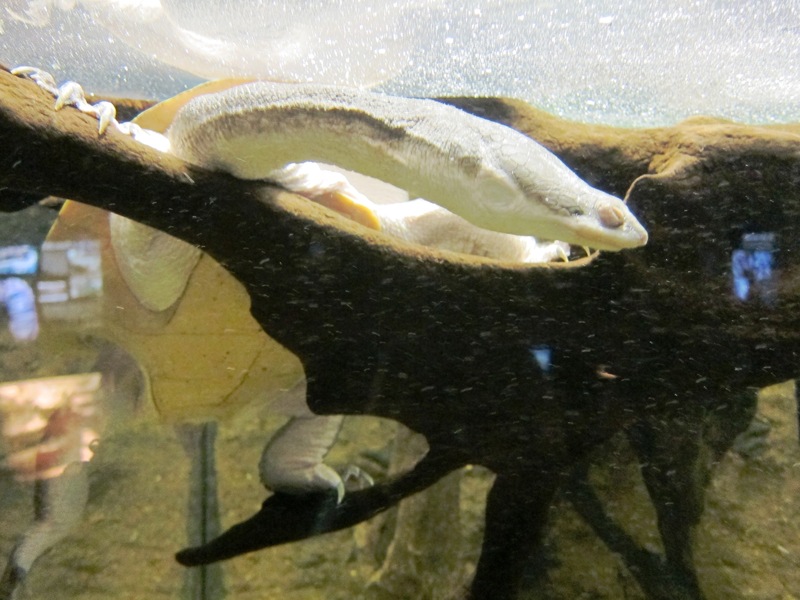 Did you know that there are rays living in rivers? Pretty cool! 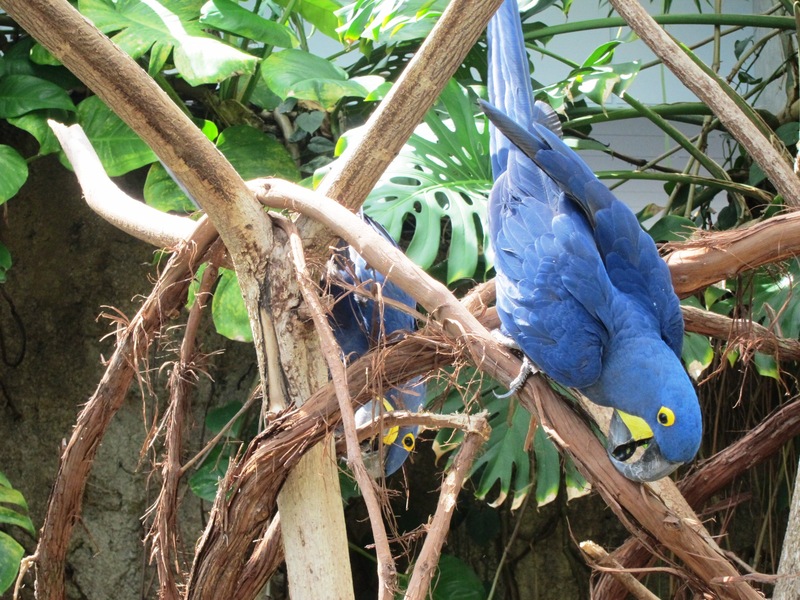 Then we found a pair of Hyacinth Macaws! 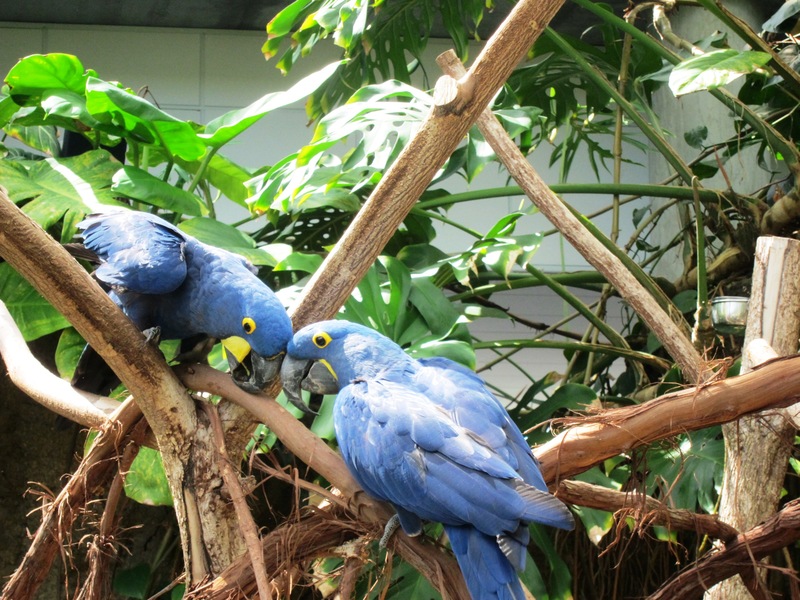 These beautiful big blue birds were so much fun to watch! We stood there for a good 15 minutes or so watching their antics! Our favorite shot of the day! Bonk! 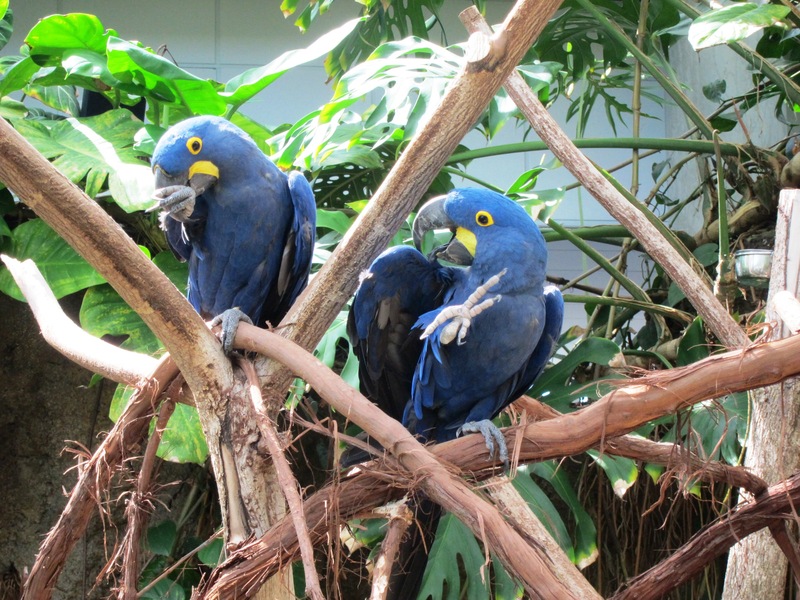 These gorgeous birds are the largest flighted parrot on the planet! We then stumbled into the butterfly habitat! Edmond was excited because he just loooves butterflies! We had a hard time getting pictures of these insects as they fly away so very fast. But it was so fun to find them. 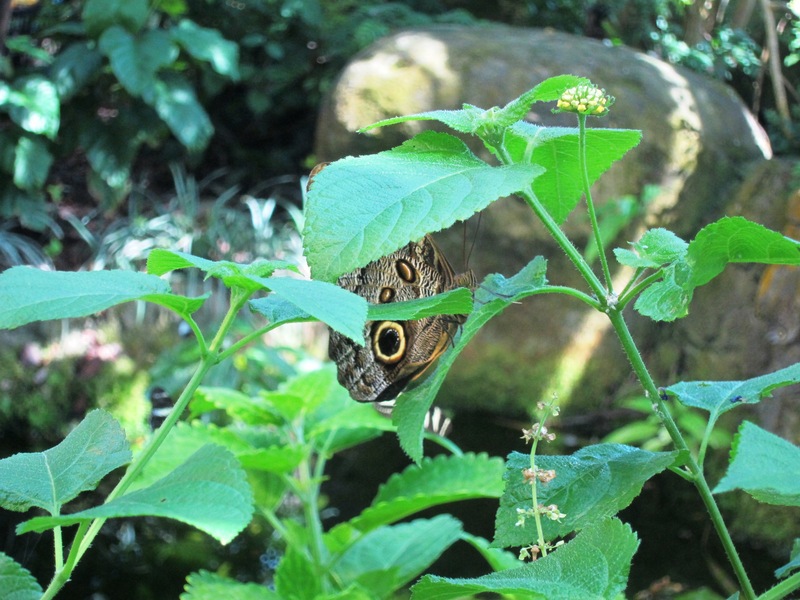 As we headed out of the warm, humid habitat that the butterflies live in, we began to get colder. Yep, we were getting close to the penguin habiat! 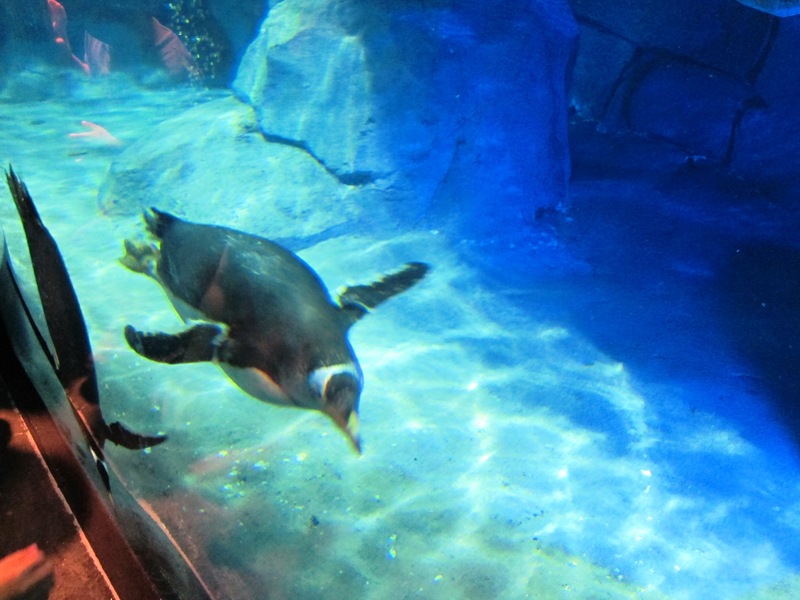 The aquarium has gentoo and macaroni penguins and they are so cute! They were getting ready for breading season and gathering rocks to make nests. 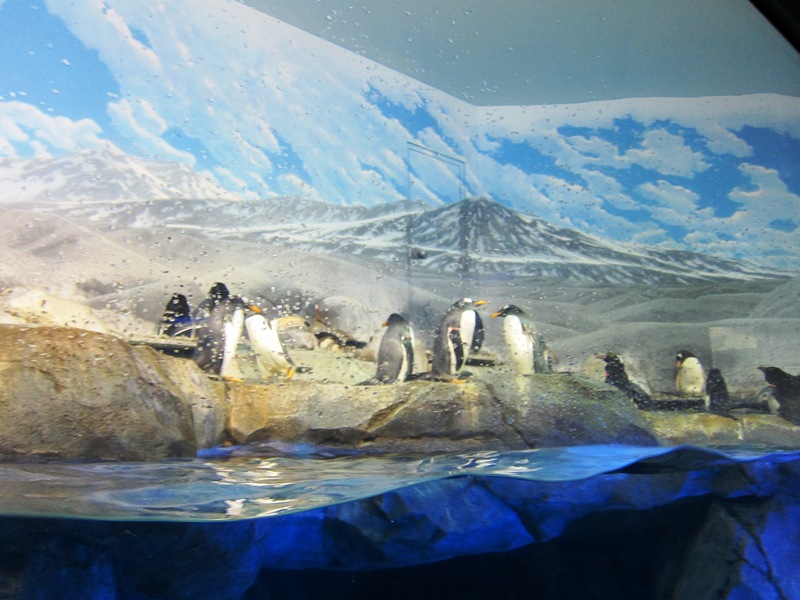 The penguins are very picky about the rocks they choose and work very hard to make the nests! Be careful though, penguins have been known to steal other penguin’s rocks! He’s getting a rock to build a nest! We finally went off in search of sharks! 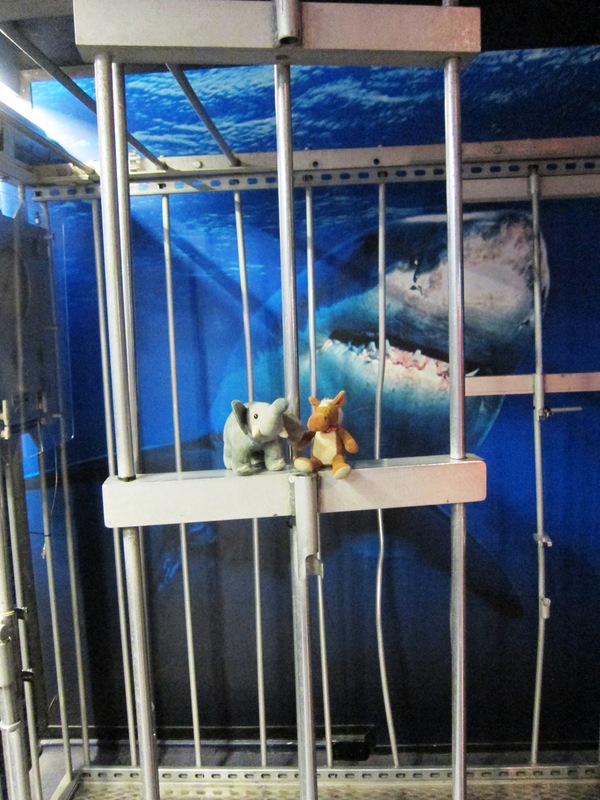 Thanks goodness we found a shark cage! 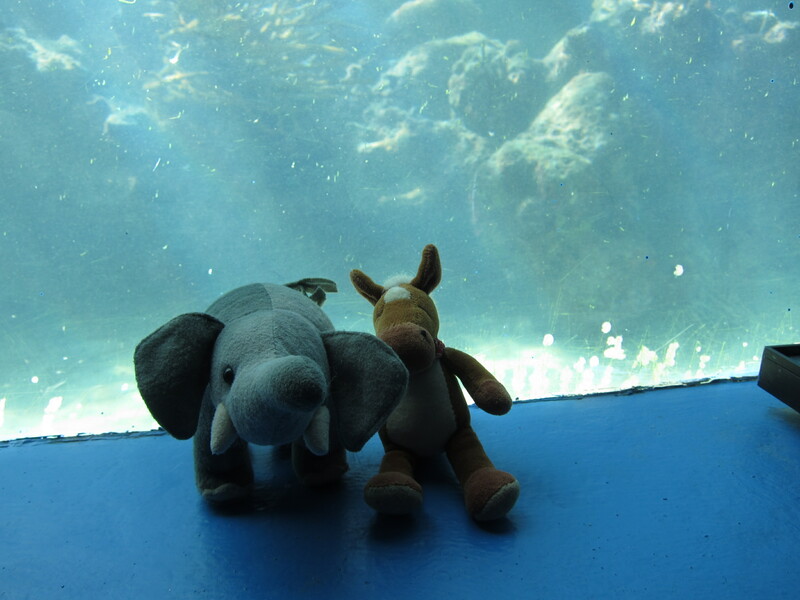 And we were in luck, because they have them at the aquarium! 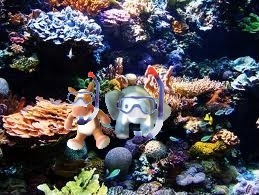 Too bad we couldn’t get a photo of them, but they have to keep swimming in order to breathe. 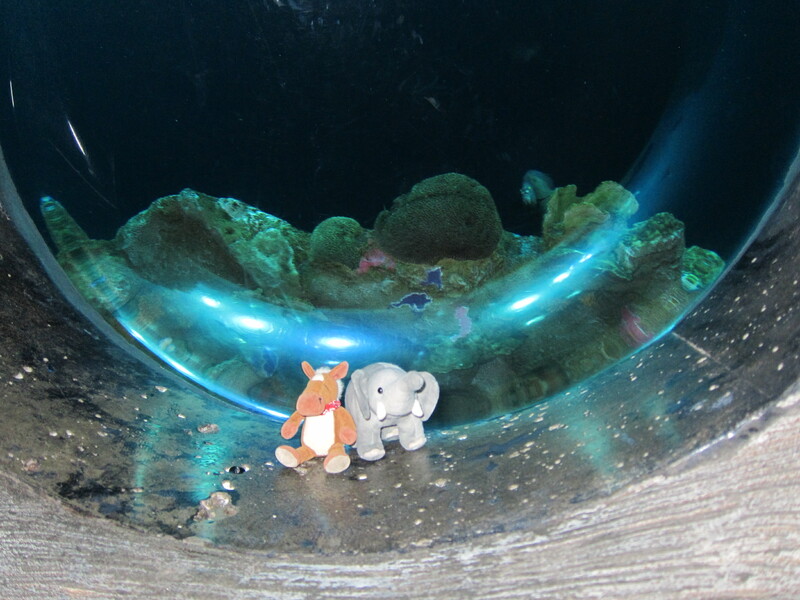 So it was off to meet some cephalopods! We chilled out and watched the octopus for a while! He was very active and just fascinating! 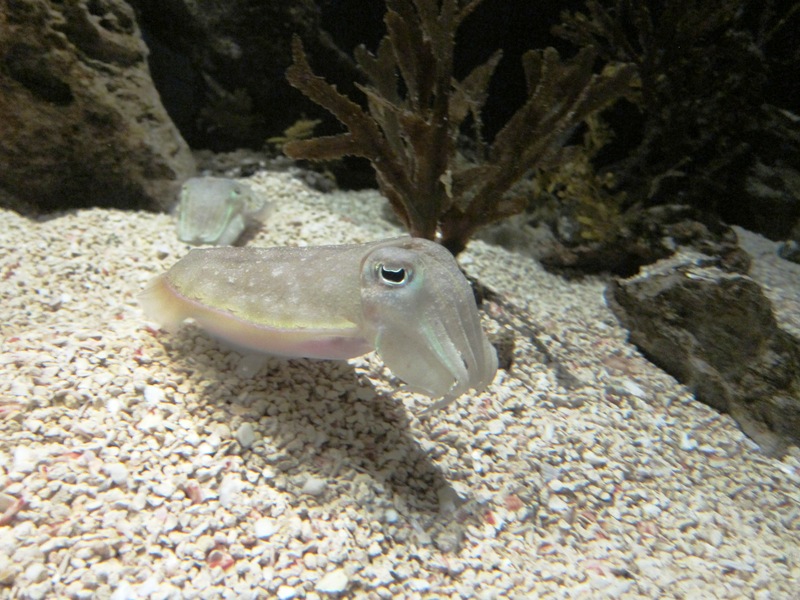 We wanted to cuddle with the cuttlefish we saw, but they weren’t up for it. Oh well, maybe next time. As we made our way out, we stopped for a photo op! It feels like we’re in the ocean! Our last stop of the day was at the IMAX theater where we saw a movie about coral reefs! Lobby of the IMAX theater! We have but one world to share! 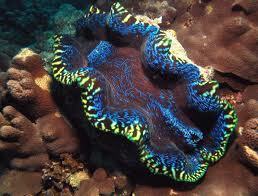 Coral reefs are one of the most amazing habitats on the planet! It made us want to go snorkeling immediately! We had an amazing time at the Tennessee Aquarium! If you’re ever in Chattanooga, you have to go there! 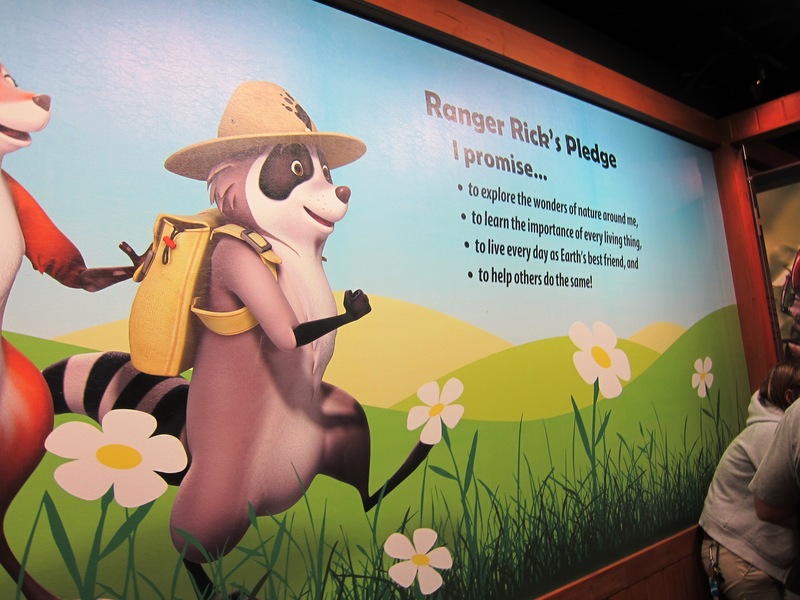 They do a great job with their exhibits, their animals and their conservation message! 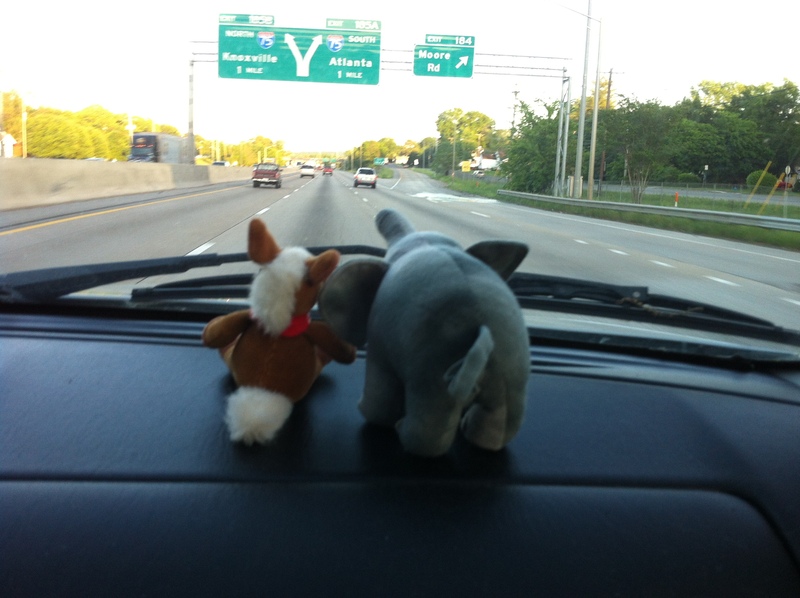 On our way home! We had a great day! 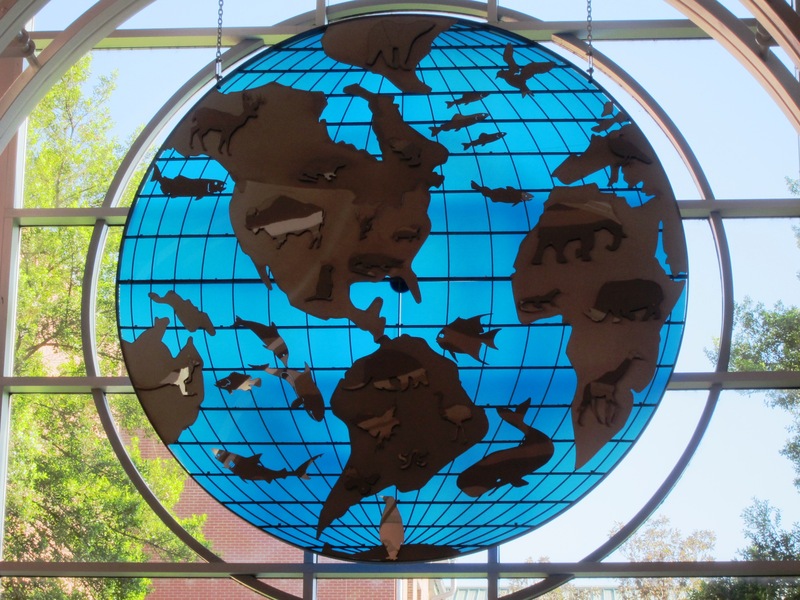 We’re celebrating the world’s oceans and their inhabitants today! 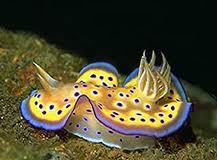 The oceans of the world are magnificent in many ways! 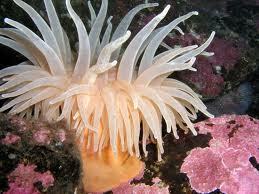 We land dwelling creatures have a hard time wrapping our heads around the oceans’ size and depth! 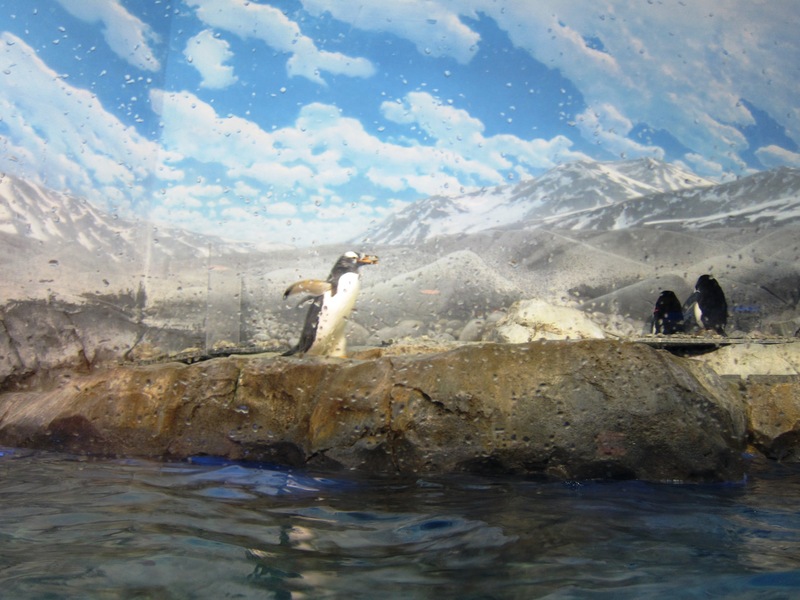 Today we’re going to celebrate this watery habitat by sharing some fun facts and photos! We’ll also be sharing ways for you to help keep our oceans clean and healthy! 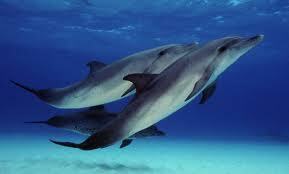 And please share with us what you love about the ocean and its animals! It’s estimated that 50-80% of life on earth live in the ocean. The oceans have 99% of living space on the planet! Humans have only explored 5-10% of the world’s oceans. The oceans cover 71% of the earth’s surface! The deepest point in the ocean is the Marianas Trench in the Pacific Ocean! The Great Barrier Reef is the largest living structure on earth! The oceans absorb CO2 to help keep our air clean. The ocean absorbs heat from the atmosphere and distributes that warmth around the planet! Wow! The ocean is sooo large and strange! Can you believe humans have only explored 10% of them? We have so much to learn! 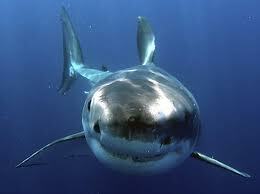 Let’s check out some photos of the some of the wild and wonderful creatures that call the ocean their home! It is vital that we keep the world’s oceans clean and healthy not just for the animals that call it home, but for the land dwelling animals too! Want to know some easy ways to help? Well, we have those for you right here! Pick up your trash! 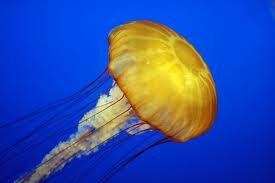 Trash can float into the ocean and it is often mistaken for food by many animals! Pick up your pet’s waste. Poop is not good for anyone J! 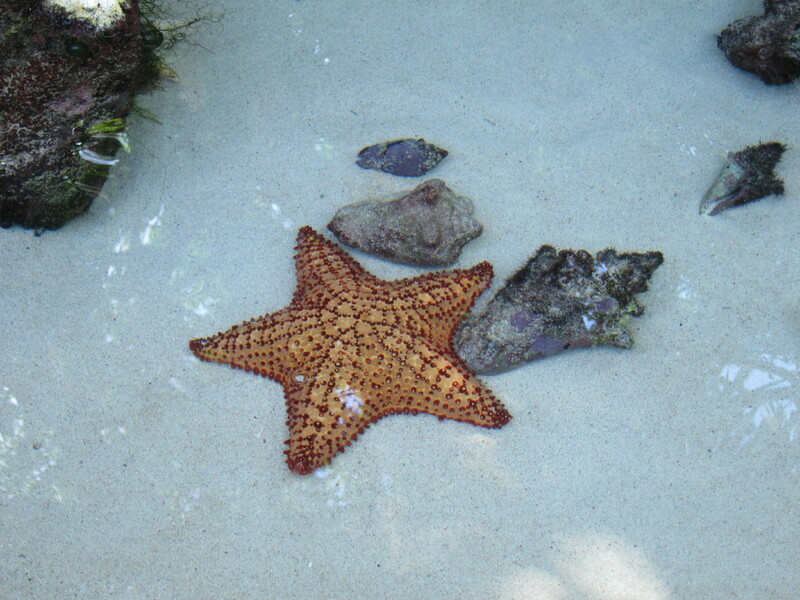 Participate in a local beach or river clean-up! Remember that all rivers eventually make their ways to the oceans and so can the trash in them. Use cloth or reusable bags when shopping. Plastic bags are a big killer of ocean life. 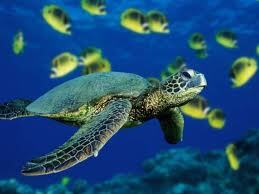 Sea turtles especially mistake them for their favorite food- jellies. Eat Sustainable Seafood. We are eating many species in to extinction. 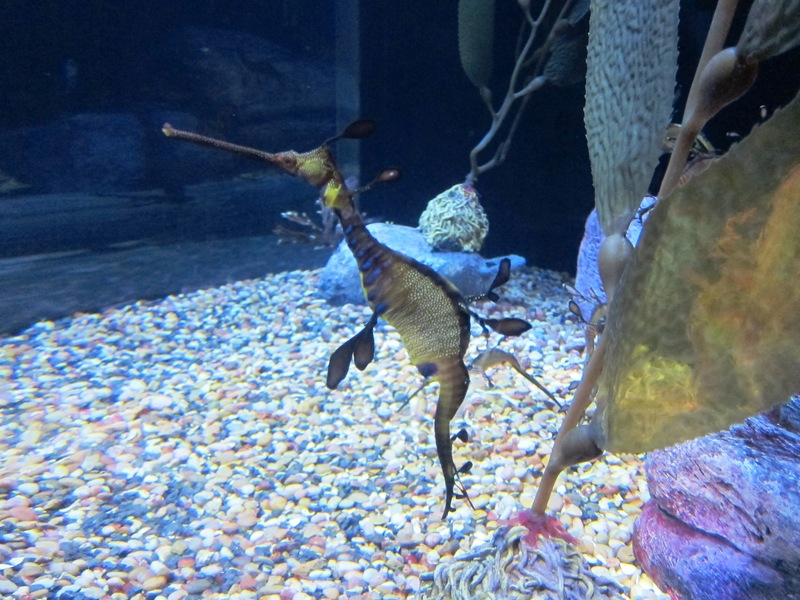 Check out Monterey Bay Aquarium’s Seafood Watch Program! They even have a smart phone app that helps you pick out the best seafood to eat! When you fish, make sure you throw away extra line and hooks. The hooks can become embedded in all kinds of creatures and the line can be swallowed or wrap around an animal. Cut up your soda six pack rings. Join an organization that works to protect the world’s oceans, like the Ocean Conservancy! 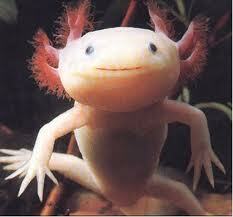 Visit your local aquarium and learn about some amazing animals! 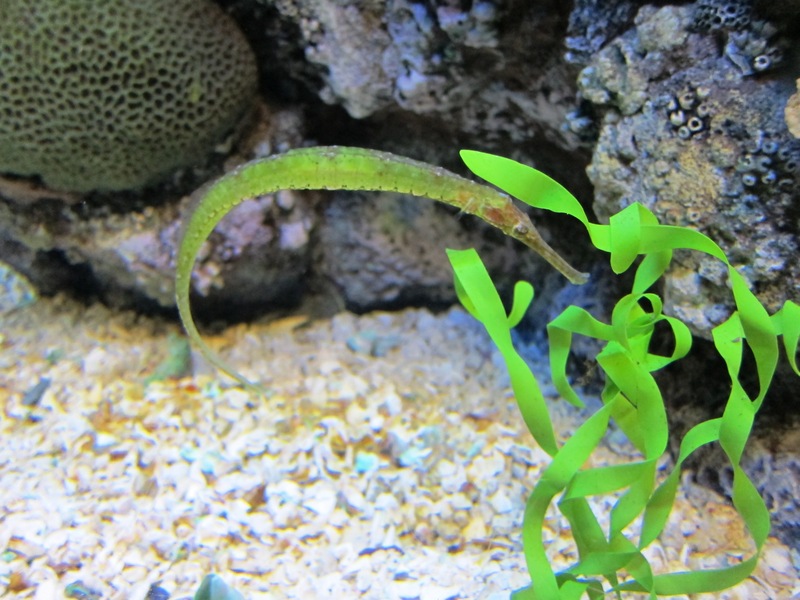 Also learn what your aquarium is doing for conservation!